In a pot I heated 1/2 tbsp of oil and first sauteed onion, carrot and celery, then I added sweet potato, pear and thyme and sauteed for a few minutes more, on medium to low fire. Then I added the paprika powder and water, brought the soup to boil and simmered for about 15 minutes until the sweet potato softened up. 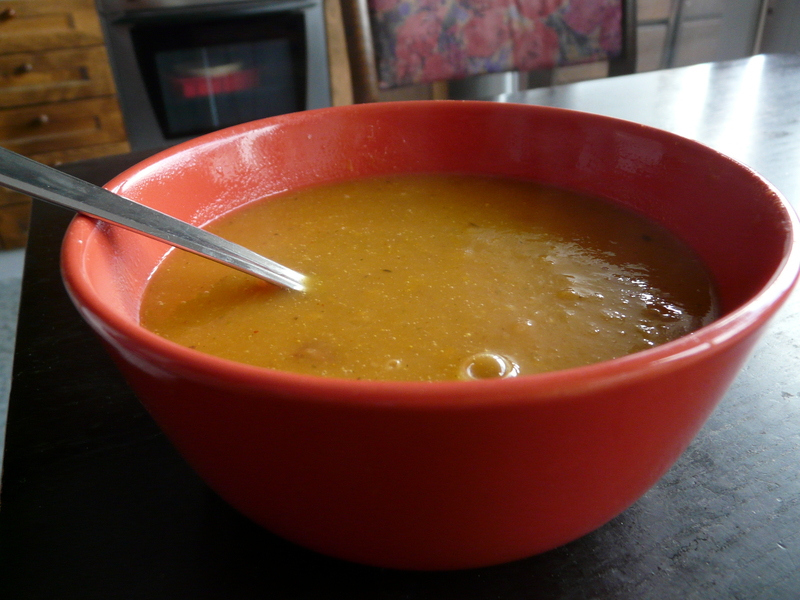 I blended the soup in a blender (dividing it into 2 batches – important, otherwise the blender might explode!). I returned the soup to the pot and added spelt cream (you could use any grain-based or soy cream), lemon juice, rice malt and salt (it needs quite some salt, otherwise it will turn out too sweet). Simmer a bit more. Soooo soothing and relaxing! !